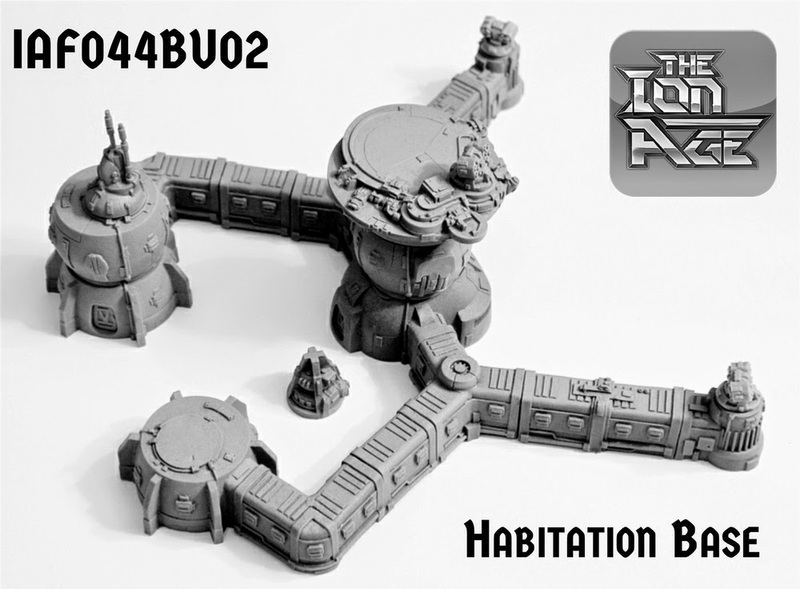 The Ion Age Blog: IAF044, IAF043, IAF070 Habitation Complex codes released! IAF044, IAF043, IAF070 Habitation Complex codes released! "Early on in the initial expansion of Humanity back to the stars within the Prydian Precinct it was noted that although large cities could be built given time in the short term a need was logged for structures which could cope with variable terrain and planetary conditions. Designing such structures was beyond the abilities of all but the core systems who turned to the pioneers who created the ubiquitous Rubbacrete and Golglass. These pioneers created materials which revolutionised construction and brought about massive improvement in lives all across the Precinct; The Seorc Compono Guild. Seorc Compono Guild (SCG) brought their finest minds to focus on the challenge and created one of the miracles of the century the Habitation Dome Riser System (HDRS). The HDRS would be standardised and shipped aboard vessels heading off world anywhere in the Precinct where they could quickly accommodate a sizeable population. It would be more than housing though as the HDRS featured additional modules which could expand the living area and turret or assembly mounts for specialised purposes. These purposes varied but typically they included self defence, fortification, repulsar platform landing pads, spire communications, hurwent shielding and power generation. Added to this was a capacity for landing aircraft such as the Skylark and hardpoints that would act as fortifications. These allowed corrals to be planned for protecting ground vehicles such as the Adder and Mullo series. 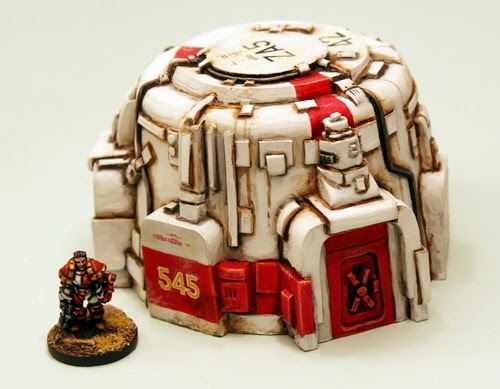 A larger and stronger built command dome was fabricated to act as a centre point in the larger HDRS settlements from where all activities could be directed. Alongside this were a series of separate spires each with a purpose such as fabrication or power generation that could be dropped easily alongside HDRS modules. The HRDS can be found on more than fifty planets and countless vacuum environments (it is a pressurised structure system) and is utilised by everyone from the Prydian Army to the lowest of the Marcher Barons and civilian authorities too. Single Hab Domes to small groups and hard points right up a city of a hundred thousand people all in HRDS towers. These larger settlements make great use of connecting corridors which can allow easy access to each point in the settlement without having to venture outside. In some locales they never got around to replacing them before the Civil War began. Camarthan Prime was one of those places." The Early Supporter Offer is now finished on the Terrain releases which are now released! Thank you to all who placed an order. We were most pleased with the attention and kind words about these new codes. All orders will be shipping out as promised end of the month worldwide. Its going to be a busy weekend for all of us here! If you have not heard of the terrain yet please read on for information about it taken from the last two weeks here on the blog. Or go to our TERRAIN PAGE. 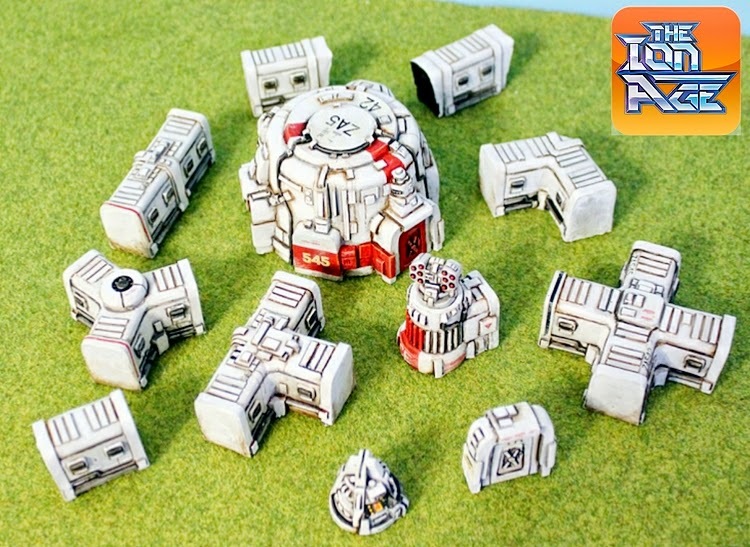 The Ion Age has gone big with our excellent 15mm terrain system. From our modest beginnings a year ago with the excellent single code IAF015 Hab Dome and then through the last year with IAF015 expansions including five different top mounts, a tower module, a landing pad, a smashed and a cratered Hab Dome then the IAF040 Block House and then a group of IAF064 Geo-Shelters too we have expanded the space opera possible of your battlefield. We have a whole string of releases for the terrain system. These are all works of miniature art made by the talented hands of Sam Croes our lead designer. Curved, detailed and with a real feeling of being literally built to withstand all that an uncaring galaxy can throw at them! You have only got until the end of the weekend to get IMP15 Witch Knight free in any order before it is retired from free and replaced with the next monthly miniatures. In reply to emails to us all of this year's free IMP series of miniatures until next summer will be placed into a Year Two Collection like the popular Year One Collection that exists now.